Many of you know that Keith is a budget spreadsheet crazy person! Of course this new adventure of month long RV travel would be no different. We had estimated how much certain things would cost before the trip and kept impeccable notes throughout the trip. I’m pretty sure we know, down to the exact cent, how much was spent! This was very important for us so that we will be able to prepare for future trips and our overall budget. 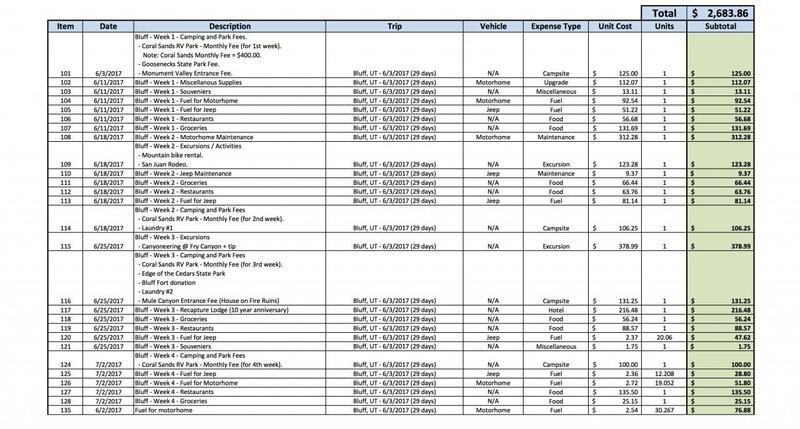 Here is Keith’s actual spreadsheet. There are some items that we would be buying even if we weren’t traveling; gas, groceries, entertainment, etc. We bought quite of bit of food prior to the trip and it’s allocated for in week one. There was also food left over once we got home. We drove quite a bit so jeep fuel, $209, is much higher than we typically spend in a month. The RV Park fee is quite low for a monthly rental, $400. This was one of the deciding factors for location in the beginning, in case it didn’t work out. Monthly fees are quite a bit discounted opposed to nightly or even weekly fees. This is one reason why we’ve chosen to do month long trips. Week one miscellaneous motorhome upgrade was to replace the kitchen faucet, which began to leak. There were other upgrades or replacements we did during the trip; solar shades for most of the windows and other odds and ends. We have the annual national park pass so this paid for a few of the entrance fees. This pass is $80/year. Locations visited; more than 15 boxes checked off our wishlist! How much would you have guessed we spent? Are there places in the budget for improvement? Absolutely! We didn’t have to stay at the lodge for two nights. We didn’t have to go on two excursions and we could have not eaten out. However, this was a also vacation for us so we had planned to spend money on certain things. Overall, we are pretty pleased with the budget and we feel like it is a good average of what would be spent in a typical month long trip. This helps us in planning our yearly budget. While researching, we’ve found others who travel full-time and share their budgets. It’s been a little harder to find people who travel the way we do that share this information. This is why we’ve decided to post our budget in such a public way. 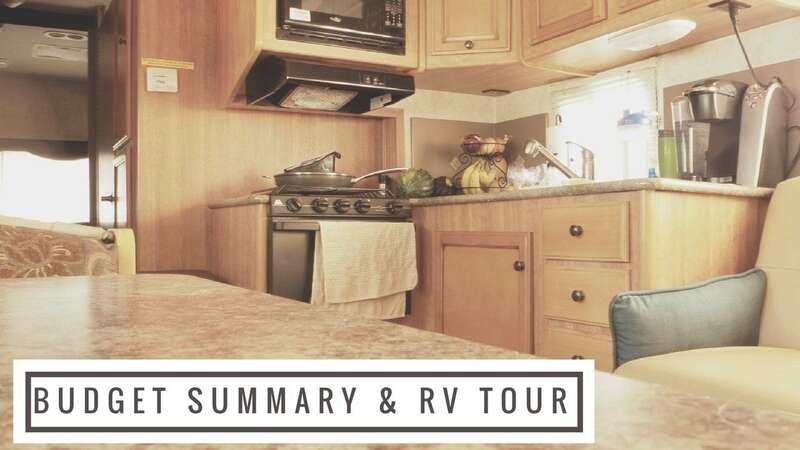 For more information on why we chose this RV read our previous post, Making Travel Happen.